I love pie of any kind but not necessarily the mess that comes with making them especially if baked in these jars. Sure it's mouth watering to see the oozing berries or other fillings over flowing off the sides of the glass but do you really want to soak and clean them later with all that baked on mess? I don't! Banana cream, coconut cream, key lime, lemon, fresh fruit pie, custard, pumpkin, the list goes on an on. You can build whatever flavor you like from homemade to no bake in minutes with this simple recipe guideline! 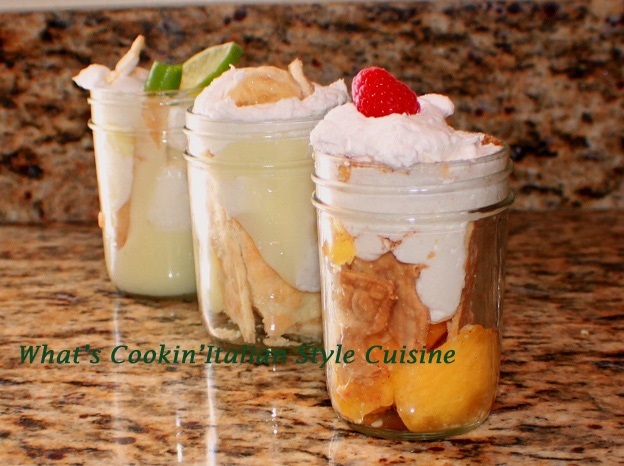 My favorite is the fresh sliced peaches layered with vanilla pudding and whipped cream! You can even add a little peach liquor for an adult version mason jars. Just a few teaspoons to soak in the crust! Deconstructed pie makes everyone smile. Making the pre made pie crust will be the hardest part which is still dang easy! You dont even have to get fancy but I like to make various cookie cutter shapes to make the crust pretty as I place it in the jar. Perfect for theme decorated pies like stars and stripes for a Holiday. This is the perfect answer to bakers on the go, and who hate to clean the mess later. These are a build, eat and place in the dishwasher dessert! I like to take the easy way out when it comes to desserts! 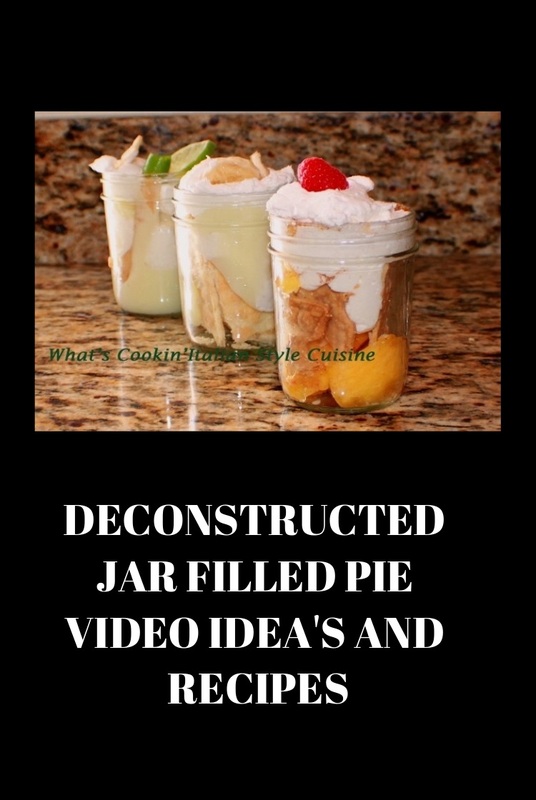 Watch the video for more suggestions and tips to combine many ways to create these delectable pies in a jar! You can use fresh fruits, canned pie fillings, pre made puddings or homemade. The skies the limit of your creative pie making combinations. I just love the simplicity and ease, hope you do too! Fast and easy but oh so delicious! You Can Skip Being Fancy! Listen, if you're in a hurry you can just bake a full pre made crust on your cookie sheet. Break it up and layer the crust in the jar. You don't have to get fancy with these mason jars. 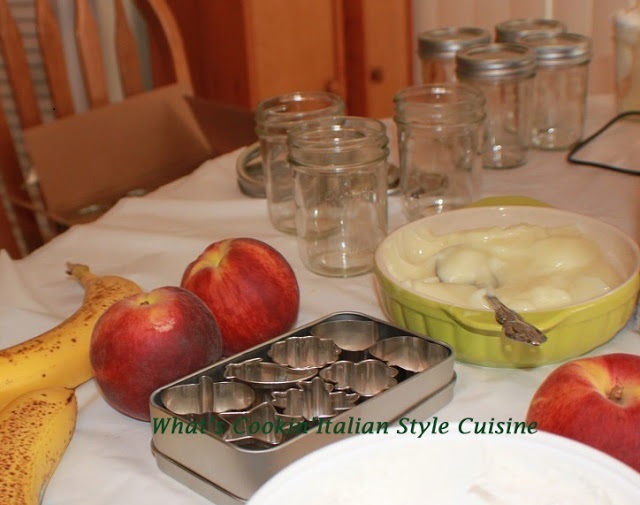 I just happen to like my appetizer cookie cutters and they are the perfect size to add to the jars. These Mason Jar Pies are so easy to make the kids can help. Store bought snack pack pudding, baked crust and whipped cream and you're good to go. I like to use two size jars, the small ones are perfect for one. The larger ones can be for a crowd. When you have company and make assorted mason jar pies like I did, everyone can choose their favorites. The best part is, you don't have another plate to clean! 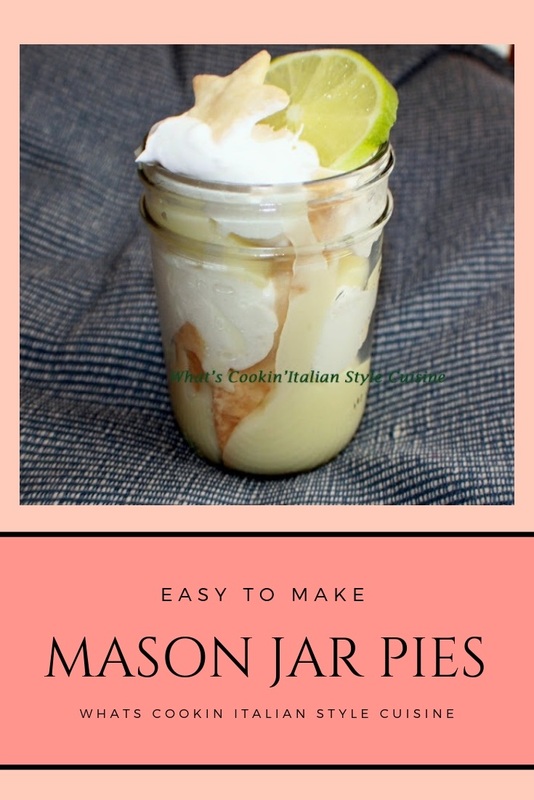 These Mason Jar Pies, are so much fun to make and eat. Make pie crust baked on a cookie sheet according to package instructions but flat on a cookie sheet then cut up in strips or you can use a cookie cutter. You can allso cut and bake them in various shapes per the package instructions on the cookie sheet. Cheesecake filling, puddings chocolate, vanilla, coconut cream, lemon, key lime or any other boxed pudding cooked to package instructions. Cookies such as oreo's shortbread, peanut butter, snickerdoodles, oatmeal, nutter butters etc. Garnishes: Sprinkles, ice cream toppings, coconut, various jams to match the fresh fruits, cinnamon and sugar mixed together, white or chocolate chips or other crushed candy bars. Add anything else you like to add that you love! Here are the ideas and suggestions I have to make your favorite pies with some basic recipes. Remember you can always heat in the microwave the filling first for a warm pie. Use the pre made cooked crust layers, warm filling layered and top with whipped cream or ice cream. Layer with whipped cream alternating with pie filling if you prefer. Line the glass jar with strips of pie crust. Alternate with whipped cream, pudding then end with whipped cream. Line the mason jar with strips of pie crust, cookie crumbs or graham crackers crumbs. 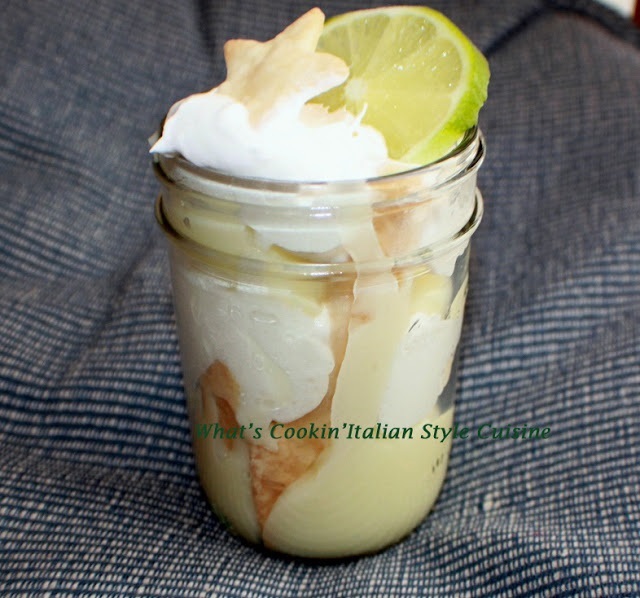 Layer with pudding or favorite fruits, whipped cream them repeat until the jar is full. Garnish with whipped cream, lime slices, lemon slices, fruits, nuts, cherries, syrups, chocolate chips or sprinkles for a fun and festive pie. Coordinate if its a holiday with color doughs or colored sugars. See video for exact instructions. Mix together till dough forms a ball, roll out dough to fit a pie plate. Place flat on a cookie sheet. 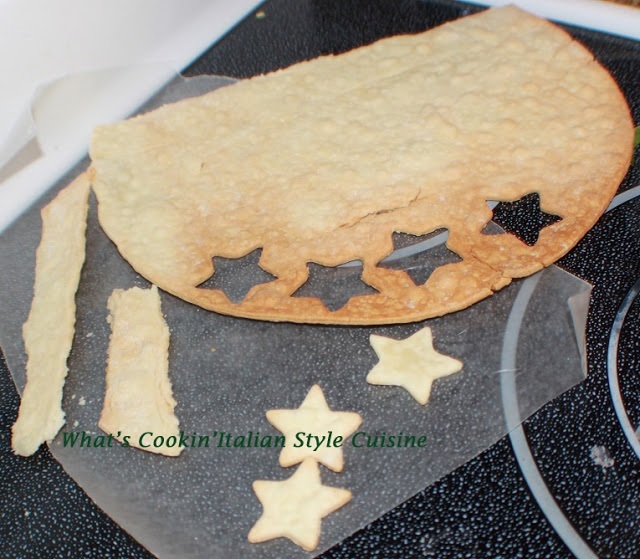 You can cut out cookie cutter shapes to the current holiday or event or just cut into strips when cooked. Proceed with layering cooked pie crust with above suggestions for pie favorites. Get creative and make a great memory! Click links below for more ideas and homemade recipes.